Our LB375 Flat Breakaway Lanyards are an economical way to wear your ID card, keys, backstage pass, or just about anything! LB375 Flat Breakaway Lanyards are made with durable 3/8” wide woven polyester material with a plastic re-attachable breakaway joint and slide bead. 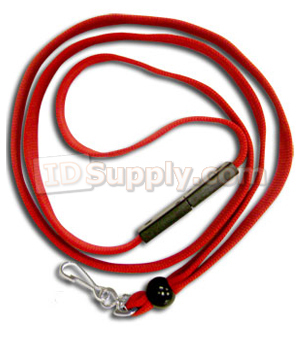 LB375 Flat Breakaway Lanyards are available with a Swivel Hook, Split Ring (Key Ring), or Bulldog Clip. Lanyard length is approximately 36 inches. LB375 Flat Breakaway Lanyards are available in Black, Navy Blue, Royal Blue, Red, Green, Purple (swivel hook only), and Maroon (swivel hook only).